A curriculum designed to help students take an inquiry-based approach to personal finance. 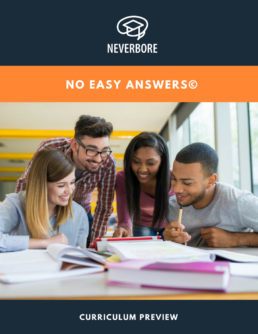 No Easy Answers includes 10 case studies. In each case study, students are provided with a detailed description of an individual’s (or family’s) life situation and a decision, such as: Should I buy a car? Or Should I go to college? The case studies progress from decisions high school students are facing now to the decisions they will face as young adults in their 20s. As they move through the curriculum, the decisions become increasingly complex. In each lesson, students work in teams as financial advisors, hired to give advice to the fictional individuals/families described. By taking a unique, inquiry-based approach to personal finance we believe that learners will build a deeper understanding of the short- and long-term decisions young adults will face in their lives – and prepare them to think through the consequences of these decisions. Inquiry learning – or Problem-Based Learning (PBL) – has been shown to be more effective at developing lasting understanding and critical thinking skills in a variety of domains, including medicine, business, science and civics. We believe it will have the same impact on personal finance. Clearly explained lesson procedures broken down into stepwise processes for use by both new and experienced teachers. Case studies explore real-world questions relevant to teenage students and financial situations they will make decisions on. Each case study addresses critical National Standards for Financial Literacy formed by the Council for Economic Education. Students practice decision-making with PACED and cost-benefit models giving them new ways to think about decision making. Students learn to access take-home pay calculators, sample FAFSA forms, auto insurance sites and other useful resources. Powerpoint visual templates are provided to help supplement each personal fiance lesson within the curriculum.